Featuring Matthew Fisher ... or is it Gary Brooker? 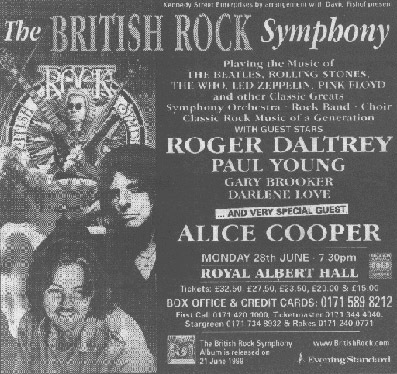 Roger Daltrey and Alice Cooper Launch the Worldwide Concert Tour of the British Rock Symphony At Royal Albert Hall On June 28th. The Royal Albert Hall concert in London on June 28th will serve as the setting for these legendary rock 'n rollers as they perform the greatest classic rock songs backed by an orchestra and gospel choir. In the words of Roger Daltrey - "expect not symphonic rock but rather a rock symphony." Created by producer David Fishoff, The British Rock Symphony is a tribute to the timeless music of the Beatles, the Rolling Stones, Pink Floyd, Led Zeppelin and the Who. The tour will cover five continents, highlighted by special guest star performances from artists including Ann Wilson (Heart), Paul Rodgers (Bad Company), Eric Burdon (The Animals), Thelma Houston and renowned violinist Nigel Kennedy. Following the launch at the Royal Albert Hall, the tour will perform in various Castles through-out England. These concerts will be filmed for an American television broadcast, airdate TBD. Look for a CD release of The British Rock Symphony from Point Music on September 14th. Soon after, the tour invades America on October 5th, kicking-off with a star-studded concert at the Rock and Roll Hall of Fame in Cleveland. Roger Daltrey was sceptical when approached by the impresario David Fishof to take part in the British Rock Symphony, Nigel Williamson writes. He only agreed to front the extravaganza when he was satisfied that it wasn't simply classical musicians playing pop music but was built around a traditional rock band using the additional dynamics of an orchestra to create "a big dramatic sound." As a veteran of two rock operas, Daltrey was an obvious choice as the main man for the three-hour show which now tours some of the stately homes of England. But the title is seriously misleading. 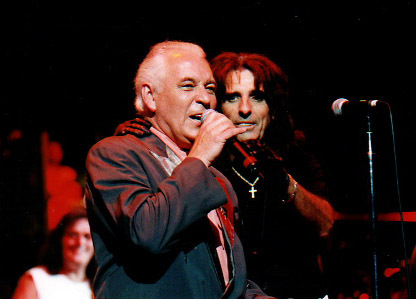 Alice Cooper singing School's Out was hardly British, for long periods the band plodded rather than rocked, and it most certainly was not a symphony. The evening might be better termed a rock cabaret built around a series of tributes to the great bands of the 1960s and 1970s. Paul Young fronted an anodyne Beatles slot that included Imagine, Blackbird and Come Together while the leather-clad Cooper sang Pink Floyd's Another Brick In The Wall. Daltrey, having delivered an unconvincing Jagger on Street Fighting Man, then saved the first half with an emotional See Me Feel Me. The second half was enlivened by the appearance of former Procul [sic] Harum singer Matthew Fisher [sic] for A Whiter Shade Of Pale and, more adventurously, the band's minor hit Conquistador. But the rest of the fare was depressingly predictable. Daltrey slaughtered Let It Be in gruesome fashion, although he made up for it with a great version of his own war-horse, Pinball Wizard. The arrangements were mostly uninspired, although the Led Zeppelin compositions Stairway To Heaven and Kashmir allowed more space for interesting orchestration than most. Profits from the tour are being used to fund instruments and tuition for struggling young musicians. But if you want an evening of unabashed rock nostalgia, you might be better advised to make a donation to the cause and spend the night at home with a bottle of wine and the original albums. BtP understands that Gary performed only Conquistador and AWSoP, with orchestra, at this show: he was not involved in other people's songs. Geoff Whitehorn seemed to be really enjoying himself, especially on the Procol numbers. Gary was worried that the promoter had submitted the wrong biography for the programme, but his office had in fact submitted the right one and there had been a mix-up on their part. He really enjoyed the Albert Hall show, and wore a suit he bought for the 80s Wintershall concerts, which still fits. Evidently he was the only one looking dressed properly for the occasion. On 31 May 2004, almost as a birthday concert, there was Gary Brooker, on KTEH, the Public Broadcast Station for the San Jose/Monterey area, with full orchestra and Geoff Whitehorn on lead guitar, playing and singing A Whiter Shade of Pale. I couldn't get all of the information from the credit roll, but I believe it was from a Connecticut public broadcast station and was a benefit concert for a cantor. From the looks of the Commander, I'm guessing it's a few years old. He had the audience and his fellow performers in the palm of his hand, with his strong vocals, the great orchestra and the familiar presence of Geoff Whitehorn lending the stamp of Procol authenticity to the occasion.